Precious metals are used in all kinds of electronic devices, automobiles, and even water and air purification systems. Tanaka Precious Metals Group has always been at the forefront of the development and manufacture of precious metal materials for use in such products. The Group's 124-year history dovetails with the history of Japan's industrial development. The Group was quick to focus on environmental and energy-related applications, and now aims to contribute significantly to expanding the applications of precious metals based on the four pillars of "new energy," "resource recycling," "development of environmentally conscious materials," and "environmental cleanup." Mr. Hidemasa Tanaka, Director and Head of the Technology Development Division at Tanaka Kikinzoku Kogyo K.K., which was established in 1885 and has a 124-year history, emphasized the excellence of precious metals as advanced materials: "Precious metals have always been used as materials for frontier industrial products. Such metals are highly valued for their stable features, high reliability, and ease of use." Tanaka Precious Metals Group is generally known as a company engaged in the gold trade. However, the lines of business in which the Group has engaged perfectly dovetail with the history of the development of Japan's frontier industrial fields (Figure 1). Tanaka was a money changer upon establishment before it morphed into a collector of the platinum (Pt) used in light bulb filaments, which was one of the frontier industrial products of that time. Tanaka was the first to engage in fine wire processing to mass produce platinum electrodes for light bulb filaments in Japan. After the war, Tanaka succeeded in achieving domestic production of the contact materials for the crossbar switchboards then used at telephone offices and commenced such production in 1955. It is said that Tanaka was able to differentiate itself from its competitors because its technologies used palladium (Pd) for the contacts. In 1964, Tanaka was the first company to domestically produce the gold (Au) wires used for mounting semiconductor chips, and Tanaka has been contributing to the advancement of semiconductor technologies ever since. Currently, the Group commands a dominant share in the global gold wire market. Today, the potential applications of precious metals are expanding with no end in sight. Without mentioning the semiconductors found in ubiquitous electronic devices, precious metals are used for all variety of items: for example, gold for connecting driver ICs in LCDs as well as platinum, palladium, and rhodium (Rh) for exhaust gas catalysts in automobiles. 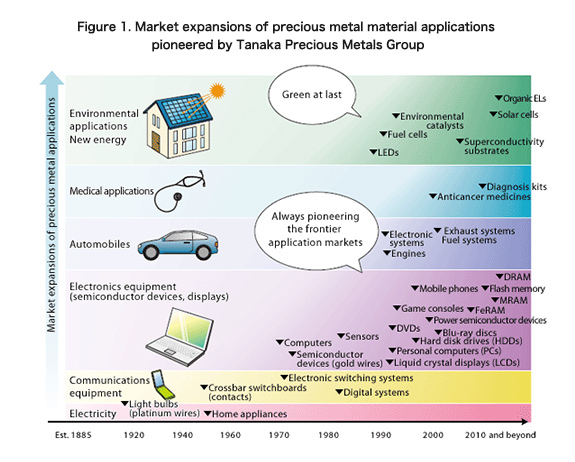 Tanaka Precious Metals Group, which has continuously supplied precious metal materials for use in frontier industrial applications, has been focusing on new energy- and environmental-related applications, which have been in the spotlight recently, since early in its history. The following sections introduce the Group's specific initiatives based on the four pillars of its environment-related business: (1) new energy, (2) resource recycling, (3) development of environmentally conscious materials, and (4) environmental cleanup (Figure 2). When speaking of "new energy," fuel cells first come to mind. In a fuel cell, a reaction opposite to the electrolysis of water occurs and a current develops during the course of that process which is extracted and subsequently used. Applications of fuel cells extend from mobile devices (including mobile phones) to automobiles as well as power sources for homes. There are a number of types of fuel cells; at this time, the most practical type are PEFCs (Platinum and Platinum Ruthenium Alloy/Carbon Catalysts Electrolyte Membrane Fuel Cells), in which platinum is used as a catalyst. PEFCs are already used in some mobile devices, and their applications in the automobile market are expected to grow in the future. 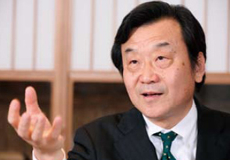 The Group has been developing PEFC-related technologies for more than 20 years, and according to Mr. Tanaka, "Currently, Tanaka Precious Metals Group has more than a 60% share of the global fuel cell platinum catalyst market." The next hot topic in new energy is solar cells, which comprise another market for applying precious metals that has been rapidly growing globally. Silver (Ag) paste is used for the electrodes on the surfaces of solar panels. Additionally, in the solar cells field, precious metals are the most likely candidate materials for dye-sensitized solar cell systems, which have recently been drawing attention for their low manufacturing costs. In dye-sensitized solar cell systems, electricity is generated by using pigments similar to plant photosynthesis. Ruthenium (Ru) complex pigments are used as the pigments in such systems. Although research on alternative materials continues, ruthenium, which has more stable features, is still the leading candidate material. Demand for power semiconductor devices is increasing, though it is more appropriate to refer to such devices as energy-saving rather than new energy. Power semiconductor devices hold the key to realizing energy savings and improved controllability in devices. Gold wires are usually used to connect semiconductor chips. However, for power semiconductor devices, in which large currents are applied, aluminum (Al) wires are more suitable. Although aluminum is not a precious metal, Tanaka Precious Metals Group uses its fine wire processing technology to make aluminum ribbons capable of carrying large currents. In addition, aluminum wires are also a good match for silicon carbide (SiC) semiconductor devices, which are currently being researched as next-generation power semiconductor devices. Since SiC semiconductor devices enable high temperature operation, aluminum wires are indispensable. As can be seen above, the Group has continued to research and commercialize all materials that may serve as alternatives to precious metals for which it could invent applications. Also in the energy-related field, the Group has committed to superconductivity materials. "In its manufacturing of products, Tanaka Precious Metals Group has been particular about joining technologies, and the Group recognizes that the new technologies used for manufacturing superconductivity substrates are important future joining technologies," explained Mr. Tanaka. The Group is currently engaged in the development of yttrium (Y) superconductivity substrates. Though yttrium is not a precious metal, the Group is committed to this project because silver materials were also used at the beginning of research and development. The Group expects this development to lead to the creation of new future technologies. Next, let's examine "resource recycling." Efforts toward realizing a recycling-oriented society which aims to reuse resources are now receiving public attention, but the effective use of waste is just common sense for manufacturers of precious metal materials. 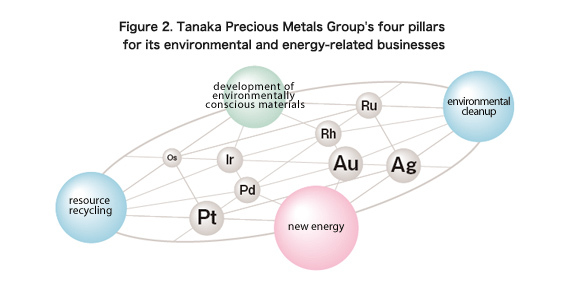 As Mr. Tanaka put it, "The impetus behind the establishment of Tanaka Precious Metals Group was collection and recycling." One example of the Group's recycling businesses can be found in the recycling of the platinum used as an exhaust gas catalyst for automobiles and other purposes. The Group established NIPPON PGM Co., Ltd., a joint venture with Dowa Holdings Co., Ltd. and Kosaka Smelting & Refining Co., Ltd., and this company engages in the platinum recycling business. 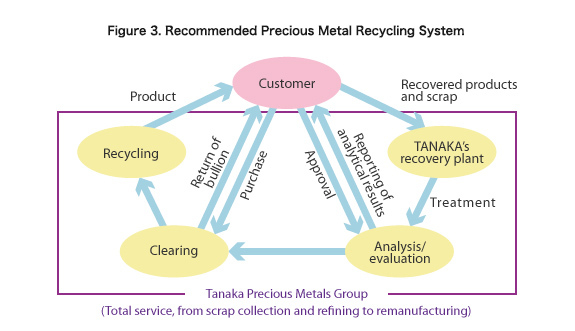 The Group also provides recycling services to system and device manufacturers who purchase precious metals from the Group (Figure 3).The Group collects not only defective products during the process of production but also the residue around plating and sputtering equipment. The Group also offers an account settlement system for bullion collected from its customers (flexible account settlement including bullion buy back, physical return, or delivery in the form of precious metal products). Systems used for such collection and recycling vary among manufacturers of precious metal materials. Each company has its own know-how and system. It can be said that the total amount of precious metals a precious metals company can collect not only largely affects its profitability but also the amount of society's trust in that company. Tanaka Precious Metals Group is accredited as a Good Delivery Referee for gold and silver by the London Bullion Market Association (LBMA), the most prestigious trade organization overseeing the global gold and silver markets. There are only five Good Delivery Referees in the world, and Tanaka is the only company in Asia accredited as such, which not only guarantees the quality of its products in the gold and silver markets but also signifies global recognition of its analytical and test skills. In the development of "environmentally conscious materials," the third pillar of the Group's environment-related business, it is important to develop materials which do not burden the environment by removing toxic substances from the production lines of the Group's plants and also during the material development phase. For joining materials, demand for practical materials which do not contain lead (Pb) has resulted in the commercialization of tin (Au-Sn) and other joining materials used for crystal devices in mobile phones. In the future, the Group plans to develop joining materials with a new purpose - to serve as a replacement for solder. he Group is experienced in improving the performance of relays, which open and close electrical circuits, by removing toxic substances from the materials comprising them. Relays are used for a wide range of purposes, from home appliances to on-vehicle equipment. Previously, cadmium (Cd) was added to the rivet contact materials used in relays' open/close sections to improve their material properties. However, in order to provide environmentally conscious products, the Group has removed cadmium from its rivet contact materials and developed a new material with properties equivalent to or better than the conventional materials. The Group's rivet contacts now have more than 50% market share in the global on-vehicle relays market. The Group is committed to the development of materials that remove substances hazardous to human health and the environment as well as that maintain clean air as part of efforts toward "environmental cleanup," the fourth pillar of the Group's environment-related business. The automobile exhaust gas cleaning system described in the recycling section above is also an example of the Group's contributions toward cleaning up the environment. In addition, volatile organic compounds (VOCs) and oxidation catalysts are also helpful. Automobiles and home electrical appliances use motors and relays, and during the manufacturing of the enamel wires used in these machines, exhaust gas containing VOCs is emitted. Catalysts using platinum, palladium, and other materials are effective in purifying and deodorizing gases that contain VOCs. Precious metals also contribute to improving water quality and preventing water pollution. Titanium platinum electrodes are used to remove marine life attached to sluice gates at power plants as well as in alkaline ion water purifiers. 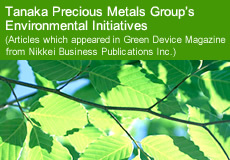 Tanaka Precious Metals Group has been involved in the development of these technologies for more than 15 years. Although not directly related to environmental cleanup, the Group's precious metals are useful in all kinds of medical diagnosis products. The Group has developed the know-how to create highly uniform nanoparticles through its process for high-purity precious metals. Since the diameter of clusters containing several tens to several hundreds of atoms of precious metal nanoparticles can be controlled to a range of 15 to 30 nm, they are used as virus kits in biological product manufacturing processes. Precious metal nanoparticles are also beginning to be used for anticancer medicines, diagnostic agents for the avian influenza virus (H5N1), and other areas relating to medical diagnosis. As can be seen above, the potential applications of precious metals are expanding with no end in sight. Of course, due to high material costs, precious metals will always compete with the alternatives which are continually being developed. To meet these challengers, Tanaka Precious Metals Group continuously researches approaches for reducing the amount of precious metals used in products as well as pioneering new frontier markets.